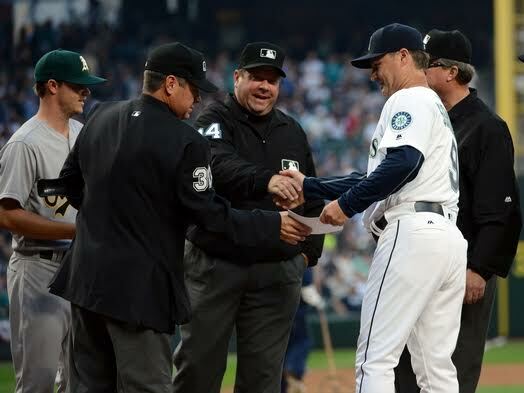 Scott Servais is a baseball lifer, a big-league catcher for 11 seasons, then a coach and personnel guy before taking his first managerial job at any level with the Mariners in October. But just because a fella has been on lots of flights doesn’t mean he knows how to fly the plane. Many fans watching on TV are certain they can manage as well as most guys who get paid for it. But it’s a different world in a major league dugout reacting instantly to changed circumstances while deploying a 25-man roster against more experienced pros in the other dugout. “Fortunately for me, I’ve got (coaches Tim Bogar and Manny Acta) — you’ll see us talking a lot during the game,” said Servais of his fellow officers on the bridge. The newness is coming fast for Servais, 48, who spent the first night Thursday in the bed of his Bellevue home after six weeks of spring training and a three-game seasonal start on the road in Texas. Lots of adjustments on the fly. “As a former player, I’m very routine oriented,” he said. “It’s taking me a while to get my routine for the regular season: The first game of a series, the meetings, going through the reports, getting a game plan, sitting with the pitching coach and getting your bullpen ready. Meeting the press is part of the routine. Then there’s the fam: Besides his wife and three kids, his parents and a sister-in-law were in town for the opener. Then there’s all the boxes to unpack, and oh, yeah, beat the A’s while changing the culture of a team and laying down rules and plans for his coaches. The team’s longest-tenured position player, 3B Kyle Seager, was asked before the game whether Servais and his coaches were pulling it off. “It’s been a different culture,” he said, “a positive group having fun. They want everybody to be themselves and have fun. They want everybody to work hard and do what you’re supposed to do, but enjoy yourself while doing it. Sounds as if Servais, in a hurry, borrowed from a figurative neighbor — Seahawks coach Pete Carroll.